Three nesting tables in a Mission design. Construction is a oak finish over selected hardwoods and veneers. The 901049 3 Piece Nesting Table Set by Coaster at Carolina Direct in the Greenville, Spartanburg, Anderson, Upstate, Simpsonville, Clemson, SC area. Product availability may vary. Contact us for the most current availability on this product. Wood & Finish Oak finish over selected hardwoods and veneers. These tables come in a set of three. There is a small, medium and large size that can be easily stacked on top of each other. Three nesting tables in a Mission design. 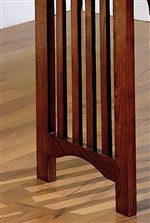 Construction is a oak finish over selected hardwoods and veneers.Use these as end tables, lamp tables, decorative display tables, or simply accent pieces. The 901049 collection is a great option if you are looking for Mission furniture in the Greenville, Spartanburg, Anderson, Upstate, Simpsonville, Clemson, SC area.